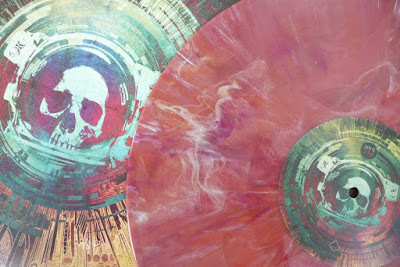 Inkymole: DJ Food's 'The Illectrik Hoax' - multi-coloured vinyl! 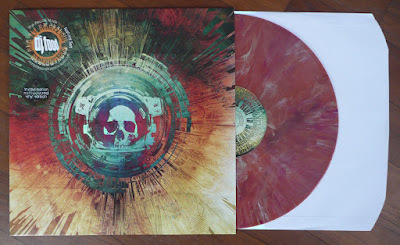 DJ Food's 'The Illectrik Hoax' - multi-coloured vinyl! Continuing in the generous vein of the launch of his album The Search Engine in January, DJ Food aka Strictly Kev is releasing this tempting package for April 21st, Record Store Day. It's a remix of his track 'The Illectrik Hoax' by Amorphous Androgynous (aka The Future Sound of London) - the 'Monstrous Psychedelic Bubble Mix'. If you're familiar with Amorphous Androgynous you'll be familiar with the sorts of sweeping soundscapes they make, so imagine this applied to Kev's bouncy jazz spaceship of a tune. The sleeve is a blisteringly bright skullface in a helmet with his coloured Henry Flint illustrations in the background, and the vinyl is a slab of fabulous meaty-looking marbled vinyl (bit corned-beefy) the likes of which I haven't seen since the 80s (and I DID have a fair bit of coloured vinyl - none with this sort of sound quality though!) What a generous treat. People think 'vinyls' (grrr) are obsolete, but with people like Kev making delicious things like this, and this, and Demdike Stare doing this you'd be barking mad to labour under that illusion for too long.